Gillian Lathey, London: Routledge, pb. 978 1 1388 0376 3, 2015, £24, 162pp. 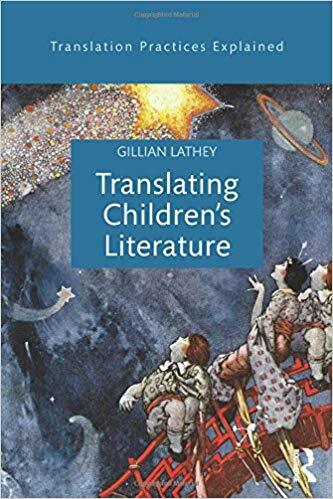 The series Translation Practices Explained has been enriched with Gillian Lathey’s book Translating Children’s Literature, the first practical guide to address various aspects of the translation of literature for children. With this publication, the complexity of translating literature, characterised by various media realisations from verbal to audiovisual forms has been recognised, and with it also the status of translators transposing all types of text aiming at non-adult readers. Lathey, until recently director of the National Centre for Research in Children’s Literature (NCRCL) at Roehampton University, London, has been a judge of the Marsh Award for Children’s Literature in Translation. An eminent author in this field, she has published The Translation of Children’s Literature (2006), and The Role of Translators in Children’s Literature: Invisible Storytellers (2010). Lathey’s study on translating children’s literature starts with an extensive introduction that is especially valuable for self-learners and students of translation. Readers are ‘warned’ that translation of books for children is underestimated, but also informed that boundaries between adult and non-adult fiction are fluid. The author stresses that the ‘adult–child duality inherent in all books for children’ (p.2) requires translators ‘to address all layers of meaning’ (ibid.) and thus reveals that translation of children’s literature may be particularly demanding. She illustrates, with reference to other texts and quotes, what is a structural feature of this course book. The first quote from a writer commenting on translation of texts for children is by Jill Paton Walsh, and the first extracts are from literary texts by Roald Dahl. Walsh’s statement contains ‘an enlightening encouragement to any writer or translator attempting to understand the artistic potential of writing for the young’ (p.3); and Dahl’s extracts illustrate how the same passage differs when addressing adult or child readers. Readers are ‘warned’ that translation of books for children is underestimated, but also informed that boundaries between adult and non-adult fiction are fluid. The section on the emergence of children’s literature underlines the connection between the social context and books for children as well as the importance for translators to possess the ‘political finesse’ (p.6) to enable the target reader also to discover the encoded message about the socio-political context of the source text. The importance of the target context is in its turn stressed when discussing the developmental issues of young readers and their specific society-conditioned expectations. The author’s first piece of advice to translators: no necessary simplification – respect the child-centredness of books for the young. By highlighting the multimedia characteristics of children’s literature, she expresses her belief that books for children may demand ‘imaginative solutions’ (p.8) and therefore require very competent translators. However, she suggests that the critical audience should study the children’s responses to translation, which still remains a neglected area waiting for research. The aim of the book is to assist ‘would-be translators’ (p.11) – bridge-builders between children and works of literature written in foreign languages. The organisation of this course book with didactic discussion points, exercises and further reading helps readers to believe that the author’s goal can be achieved, because the text offers various types of helpful stimulus for effective work to students and all those who wish to be informed about contemporary approaches to the translating of children’s literature. The author puts special stress on the narrative communication with the child reader (Chapter 1), the translation of cultural markers and intertextual references (Chapter 2), and on the translating of the visual and audio aspects of texts for children and young people (Chapters 3, 4 and 5). Chapter 6, discussing retellings, retranslation and relay translation, all typical features of children’s literature and the canon, 22 concludes with the warning that future translators ‘should also be aware that their published translation might be used as the basis for a relay translation without acknowledgement or payment’ (p.125). The last chapter, focusing on children’s publishing, globalisation and the child reader, gives further invaluable insight into the copyright status of translators’ work and their working with editors and publishers. This book by Lathey thus addresses the main aspects of translation of (children’s) literature and is therefore highly recommended.